Trump Administration: Migrant Families Can Be Detained For More Than 20 Days Now that a judge has ordered a stop to separating families, the Justice Department says it can hold families caught illegally crossing the border until their immigration proceedings are resolved. 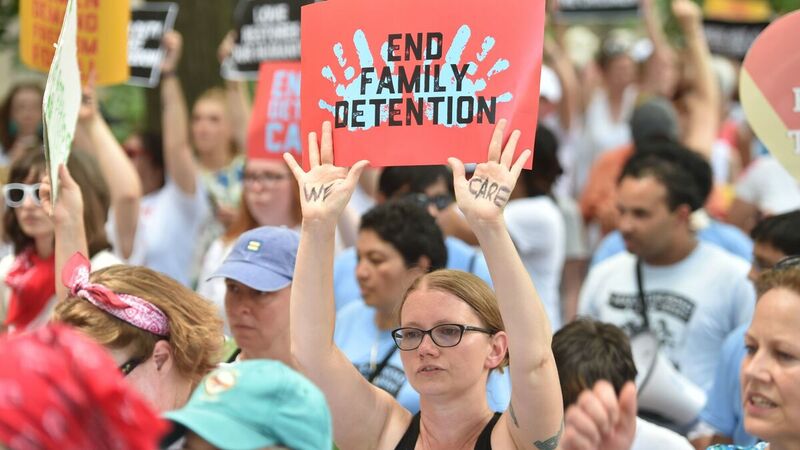 People demonstrate in Washington, D.C., on Thursday, demanding an end to the separation of migrant children from their parents. On Friday, the Justice Department said in a court filing that "the government will not separate families but detain families together during the pendency of immigration proceedings." In response to a federal court order, the Trump administration announced a new policy with regard to migrant families on Friday. The administration will now hold families together for longer than 20 days. The Trump administration has been widely criticized by opponents and allies over children being separated from their parents by U.S. authorities at the border. President Trump signed an executive order on June 20 that ended the policy, but in his remarks said the government was going to "keep the families together. I didn't like the sight or the feeling of families being separated." To do this, however, would require modifications to a decades-old settlement called the Flores agreement, which limits the amount of time children can be held in federal detention to 20 days. On Tuesday, a judge in California set a 30-day deadline for reuniting parents and children. In the court filing on Friday, the Justice Department argued that now that the judge has barred separation, the government could detain families until their legal hearings have concluded. ".... for the reasons explained, the Flores Agreement permits the Government to detain families together given the nationwide order in Ms. L that bars the separation of families in DHS custody. To comply with the Ms. L injunction, the government will not separate families but detain families together during the pendency of immigration proceedings when they are apprehended at or between ports of entry and therefore subject to the Ms. L injunction." NPR's John Burnett reports that the Department of Homeland Security "favors detention, saying detained immigrants cannot abscond and skip their immigration court hearings — and makes them easier to deport if they don't receive asylum." Construction of tent encampments is expected begin after July 4 on two military bases in Texas, which will serve as housing for migrant families apprehended at the border. "The Trump Administration has been engaged — since January of 2017 — in restoring order to the lawlessness at the southwest border and protecting our nation's citizens, but we are beholden to a broken immigration system that Congress has refused to fix and that courts have exacerbated," a Justice Department spokesman said in a statement. "While Congress has recessed for the 4th of July holiday, we continue to urge them to act decisively in order to solve the crisis at our border and end 'catch and release.' "